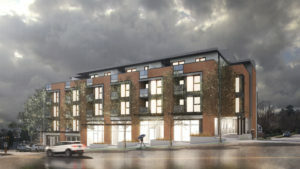 The site consists of four lots on the north end of the block on the west side of Fraser between 64th and 65th Avenue. The total site is 100’ deep and 125’ long. It slopes to the south about 11 feet along its frontage. This required stepping the building section which created significant challenges to detail to meet passive house thermal bridging requirements. This building is designed to have low operating energy consumption and low maintenance. This will keep the project affordable and profitable throughout its life. The primary material of the building façade is brick and cementitious panels that relates to the neighbouring context. The roof system is designed to allow water to drain to the exterior of the building through a series of gutters to minimize cold pipes within the thermal envelope. The structure is wood frame construction with a double exterior wall to achieve high insulation and air tightness. Roof insulation is installed both in the joist cavity and continuously above the structure. High efficiency heat recovery ventilators (HRV) are located on the top floor and serve a stack of units. The HRVs will continuously supply fresh air to living and sleeping areas and continuously exhaust bathroom and kitchen areas. They will be balanced upon installation and located off the common access corridor to facilitate servicing and changing filters. CO2 heat pumps will provide the primary source of hot water with electrical backup.